These Netflix movies based on books are perfect for kids 8-10 any time of year. These Netflix titles include classics, live action, animation, comedies, creepers, and heroes. I remember taking a college course called something like “Intro to Fiction and Film.” We would read the book and then watch the movie in class. Who would have thought that movies based on books on Netflix would be a thing…15 years later! Then, we’d have discussions about the similarities and differences. I recently stumbled upon a similar list on Netflix and thought I would share what I found. 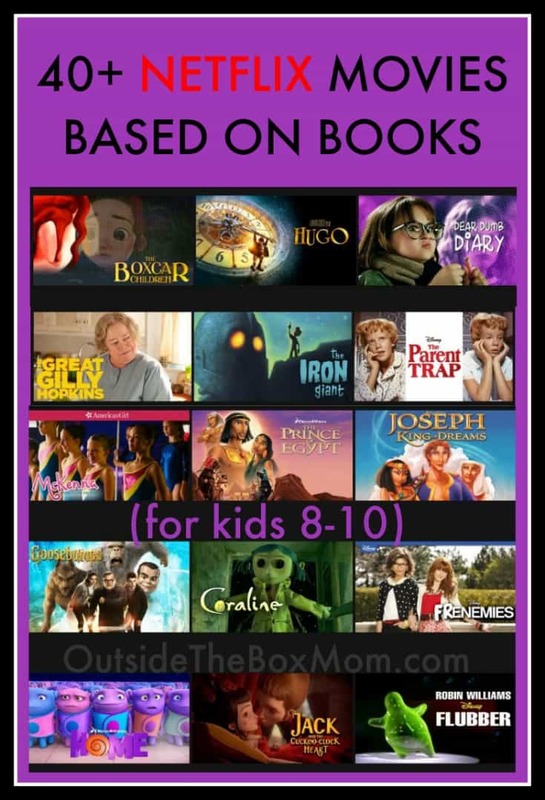 This list of movies based on books for ages 8-10. If you’d like more direction or opinion about that, check out Common Sense Media. These are great for sick days, school breaks, Summer break, or general enrichment. What better way to spend a weekend than by binge-watching Netflix?